The story is told that in 1603, Juan Maningcad, a fisherman from the barrio of Caysasay in the town of Taal, discovered a beautiful statue of the Blessed Virgin in his nets. Even though the small wooden statue measured only about six inches, and was soaked with water, it gave off a beautiful light. News of the extraordinary beauty of Juan's find spread quickly, and upon hearing the news, the local priest and town judge were so impressed by its beauty they displayed it at a festival in the town of Taal. Then it was placed in the care of a woman who had an urn fashioned for it. However, each evening the statue disappeared only to return the next morning. This strange occurrence continued even after the local priest moved it to the church for safekeeping until one day the statue disappeared for several years. Later in 1611, the image was found by the hollow of a rock beside the the spring in the village of Caysasay. The village was given this name because of the kingfisher birds called Caysasay which were common to the area. Many people came to the spring and drank its water. Some even bathed in the water of a nearby spring and reported miraculous healings and cures. In 1732, the town of Taal became the prosperous capital of the Province of Taal largely because it provided safety for Spanish galleons which arrived from Mexico and found protection from typhoons in Taal Lake. As they arrived, they would honor the image of Our Lady by firing their cannon as they passed her shrine. 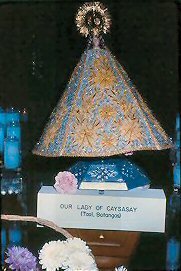 The visions of Mary at Caysasay are thought to be the first recorded apparitions of Mary in the Philippines and in the whole continent of Asia.